Express your love to the one who cares! It's the season of love :) A time to expect lovely things, a time to tell someone special how much they matter to us. While some of us are struggling to make our near ones understand us, some are fortunate to have someone who really understands and cares. So this season of love, how about surprising those who give us the strength to go on! 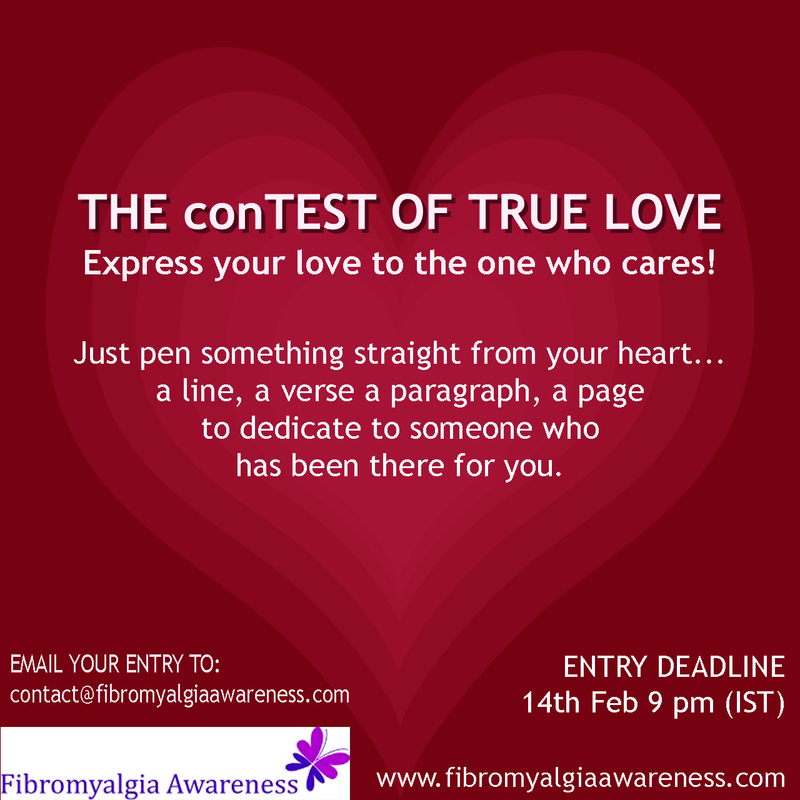 Inviting entries for the THE conTEST OF TRUE LOVE. Write a small post (article) or a poetry or even a couple of lines to dedicate to someone who has been there for you. Tell them how much their presence matters. It's tough for a person to deal with a loved one's chronic pain, inability to do some many things, mood swings and all the symptoms. Yet, they become our support system, our strength. We feel low so many times but we know they are there for us and we hold on to that good thought. We keep going with the power of that love. So take a few minutes and tell someone who cares how much the person means to you. Since we are all in the same boat in the journey of pain, let us have no strict rules. Just pen something straight from your heart. A line, a verse a paragraph, a page but not a book for now!). One post / message per person allowed. WHAT NEXT: We will go through the entries and publish all of them on our blog. You can check them out on the blog. You can share this blog link then with your special person or even on facebook etc. for the world to see! PRIZES??? The winners will be announced on the Facebook page of the blog. The best entry will be featured on the home page of our blog for a month. 3 runner-ups will be featured on the blog until the end of this month. Special mention to 3 other lovely entries. So hurry up... pen your thoughts now and then spend a lovely Valentine's Day! To my wonderful Husband Major Bradley K Baucom. First of all my Love I LOVE YOU SO MUCH! There is never a day that goes by that I don't think of at least one thing about you that I appreciate, the person that you are is amazing to me. You are a man of Love, Honor and Loyalty. What else could a gal ask for. You being my husband is all I need for Valentines day and every day after. I love you with allllll my heart and alllll that I am....even on my weak broken down days...probably more on those days cause I am so blessed to have a husband who tries so hard to understand and support me. That is HUGE! I love you my lover forever and ever to infinity! Thank you for your love and choosing me to be your wife to grow young with <3. Wow Terri, that was wonderful. pls share your email id so that I can mail you a small banner for the same.